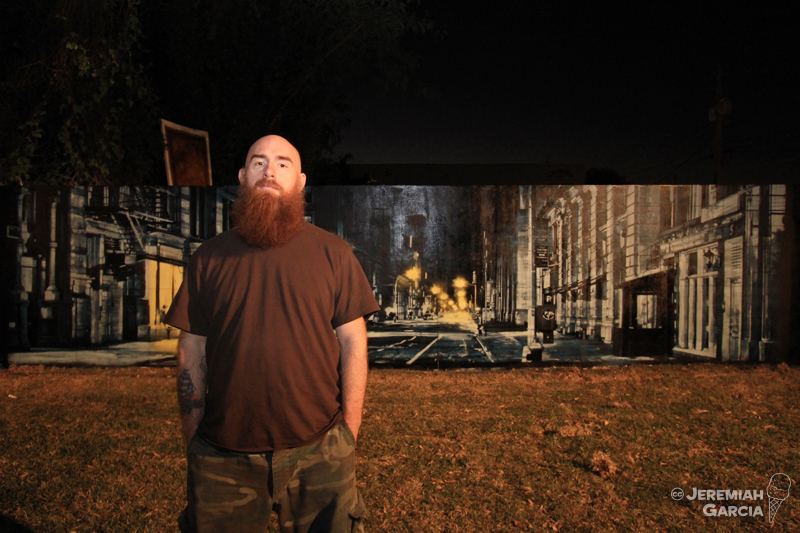 Logan Hicks with the mural he painted for Wynwood Walls in Miami, Florida in 2010. Photo by Jeremiah Garcia. For those who are very involved in the street art community, Logan Hicks is a bit of an odd but much-loved figure. On the one hand, he is a very important link between many people in street art because he’s been around for a long time and has been involved in organizing projects like Primary Flight, and his stenciling technique pushed the medium forward significantly. On the other hand, he isn’t much of a street artist since he rarely paints murals and has hardly done any illegal pieces since developing his trademark style. He’s more of a studio painter who happens to use spraypaint, but, as opposed to many so-called “urban artists” who jumped on the street art bandwagon in the mid 2000’s but stuck to gallery work, Hicks is well-respected in the street art community. Hicks says flat out that the internet is how he got his start as a serious artist, jump-starting his career by getting his work in front of people around the world instantly. He was posting on the Stencil Revolution forum, and, like a lot of stencil art, Hicks’ pieces work well when viewed in photographs. Some art doesn’t translate well when documented in a photograph, like pieces that are extremely detailed in a way that is not photorealistic or need more than one shot for the viewer to grasp, but stencils tend to work well photos, and photos are easy to post online. The Stencil Revolution website/forum was founded in 2002. The site began as a school project for the Australian street artist Prism. Hicks began posting to Stencil Revolution shortly after the site was founded in 2002, uploading photos of his art for others to comment on. In some ways, the site was a proto-Flickr, with users posting photos for others to view and comment on, except that, unlike Flickr, the site had a specific focus. According to Hicks, Stencil Revolution “was the meeting hub for every stencil artist out there.” In fact, the site was such a hub that it was how Hicks first communicated with Jeremiah Garcia, a stencil artist who, as Hicks and Garcia would later find out when they met in person, lived in the very same building as him. While many of the artists on Stencil Revolution were making pop art or Banksy-like puns with 1-2 layers, Hicks was posting photos of his 5-8 layer stencils, and soon he began to see others adding more and more layers to their work. Even in the relatively early days of street art shared online, Hicks’ art sparked development in the global stencil community in a way that absolutely wouldn’t have been possible just a few years before. 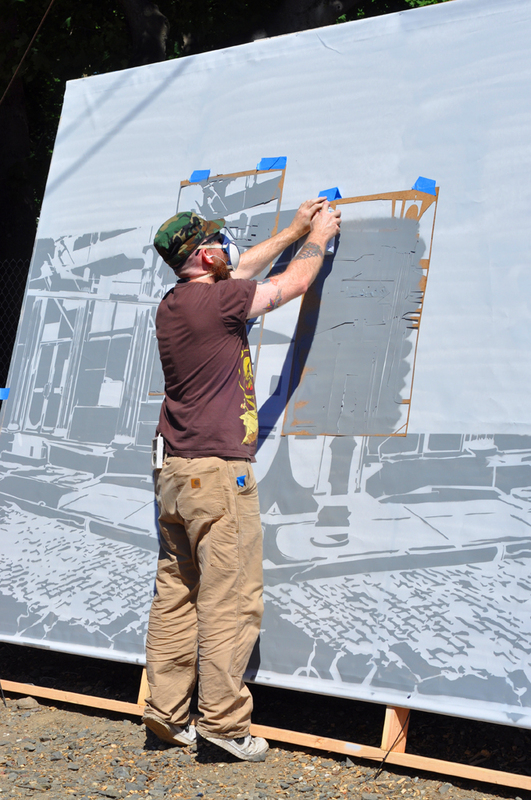 Logan Hicks at work on the mural he painted for the Electric Windows project in Beacon, New York in 2010. Photo by Jason Persse.